30 minutes a day. That is all it takes to get the word out about your mobile storage operations. It is all it takes to tell your customers what you can do for them. Whether you schedule it for right before lunch or just before closing time, it is important to build 30 minutes of time a day into your schedule so that you can grow your business. In fact, you will be amazed at how much marketing you can get done in those 30 minutes. Social media is a fantastic tool that you can use to grow your business by leaps and bounds. In 30 minutes, you can prepare a week’s worth of Facebook posts, schedule dozens of Tweets, or upload a slew of photos to your Instagram account. These easily digested pieces of information will build brand awareness and authority. 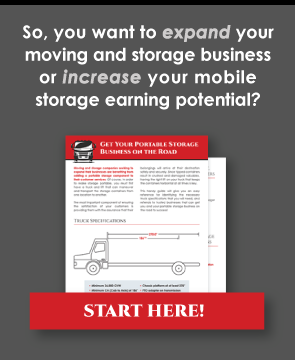 A mobile storage business should always be working to expand their email marketing efforts. Email marketing is a way to build brand awareness and keep your business in front of your customers. Existing customers, former customers, and prospective clients will appreciate your insights and knowledge delivered directly to their inbox. A new real estate agency is opening? A local business is expanding? A new business is entering the market? In 30 minutes, you can contact these prospective clients and partners to discuss your services and the ways they could benefit from mobile storage. These cold calls have a strange habit of becoming hot leads. Your best source of information is your clients. They can tell you what they like and dislike about your services. This information makes it possible to see your business from the viewpoint of your customers. While it is not direct marketing, it does build loyalty. When customers know you appreciate their opinions, it makes them more comfortable. A comfortable and satisfied customer is one who will tell all their friends, family, and coworkers about your business. A monthly newsletter is a great way to build brand awareness and generate respect for your business within the community. When building newsletters, be sure to focus on the ways customers within the community are benefiting from your services. Businesses within the area will appreciate the shout out and will be happy to forward your newsletters to their clients so that they can get a better understanding of their operations and successes. In turn, their clients and contacts who read these letters will discover your business and identify ways that you can help them as well. Microsoft Movie Maker is easy to use. It is also free to download. A free, easy-to-use program is one you can use to grow your business. In 2 1/2 hours a week, you can make dozens of 30-second videos that your clients can watch in bed, on the subway, or while they are taking a break from work. When these videos are packed with moving tips and suggestions on how to get the most out of mobile storage, they are videos you customers will bookmark and remember. 30 minutes isn’t a lot of time. But it is all it takes to take your marketing efforts in the right direction. Like a fire, 30 minutes a day grows into 2 1/2 hours a week, 10 hours a month, and 120 hours a year. It is time well spent that will have a significant impact on your bottom line and the brand awareness of your mobile storage business.